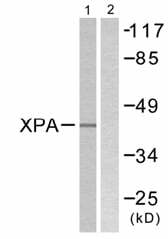 ab58464 detects endogenous levels of total XPA protein. Synthetic peptide derived from internal sequence of human XPA. Our Abpromise guarantee covers the use of ab58464 in the following tested applications. WB 1/500 - 1/1000. Detects a band of approximately 41 kDa (predicted molecular weight: 31 kDa). Involved in DNA excision repair. Initiates repair by binding to damaged sites with various affinities, depending on the photoproduct and the transcriptional state of the region. Required for UV-induced CHK1 phosphorylation and the recruitment of CEP164 to cyclobutane pyrimidine dimmers (CPD), sites of DNA damage after UV irradiation. Defects in XPA are a cause of xeroderma pigmentosum complementation group A (XP-A) [MIM:278700]; also known as xeroderma pigmentosum type 1 (XP1). XP-A is a rare human autosomal recessive disease characterized by solar sensitivity, high predisposition for developing cancers on areas exposed to sunlight and, in some cases, neurological abnormalities. Group A patients show the most severe skin symptoms and progressive neurological disorders. Belongs to the XPA family. Ubiquitinated by HERC2 leading to degradation by the proteasome. ab58464 has not yet been referenced specifically in any publications. Publishing research using ab58464? Please let us know so that we can cite the reference in this datasheet.